Here’s our weekly guide to the upcoming motorcycle events and rides that are happening within the next month. Don’t see an event that’s happening in your neck of the woods? Leave a comment to let us know. The Speedway offers a full week of racing including the “Legends of Racing”, dirt track races, the Daytona Supercross, the Harley-Davidson TwinSports, 600cc SuperSport International Challenge and the Daytona 200. Other events include the Harley-Davidson Museum, indoor show and Dresser Light Show, and several other motorcycle shows including vintage and custom bikes, European & Japanese motorcycles, sidecars and trikes. There are concerts, fashion shows, technical seminars and demo rides. 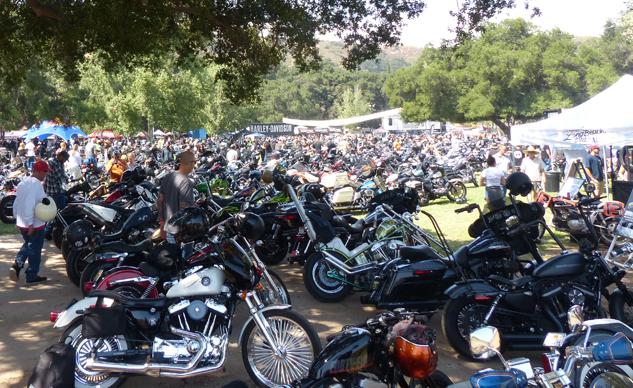 You can join in a Poker Run, go to a motorcycle swap meet, or enjoy one of the several free bar-b-ques. Group rides, celebration, mateship, dinners, raffles. Is there anything else you need? So come along, get to know the members of AuStrom and their great mateship, and even be ever so slightly persuaded to see just how much fun being an Australian V-Strom Rider really is. Come out to San Pedro, CA to participate in M Gymkhana where it’s all about the riders capabilities to navigate around a tight, predetermined course with as few errors as possible. M Gymkhana with KTM North America will be hosting the first Annual International ConeMonkey Cup in sunny Southern California. The location will be in San Pedro, CA right next to the SS Victory Lane in Los Angeles Ports of Call, just north of Long Beach. Giddy Up Vintage Chopper Show is a custom motorcycle show at River Road Ice House in New Braunfels, TX on March 31, 2018. The OG Moto Show is an annual motorcycle event located in Downtown Los Angeles featuring select Cafe’ Racer, Bobber, Classic, Tracker, Scrambler, Old School Chopper, Modern Classic, Brat and full custom motorcycles on display in a unique setting.